Sometimes shopping is better when it’s simple and sweet and the options are limited. That’s why we think we’re going to love this new year-round sample sale in Mockingbird Station. Unfortunately, only sizes 2, 4, 6, and occasionally 8, are carried, but if that suits you, you’ll love the deals. 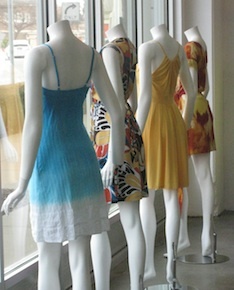 Feminine dresses, colorful cotton tanks, ruffled minis, long, drapey tees, and jeans from L.A. designers are half the original prices. The shop has only just opened, but we haven’t seen a price tag reach over $59.